Tammy Lee Anderson, holds a Master of Arts degree in Kinesiology and a Masters of Science degree in Marriage and Family Counseling from California State University, Fresno, she earned her undergraduate degree in Theology and Philosophy, B.A. from Loyola Marymount University. As a kinesiologist (Exercise Physiologist) and practitioner of the Rolf Method of Structural Integration she specializes in facilitating patients physical well-being as well as helping clients make connections to their emotional and spiritual health and wellness. Tammy has been in private practice since 1990. As well as maintaining a successful practice Tammy is ranked as 5th degree black belt and Sensei, (Japanese title for teacher), under Shiohira Shihan, Pacific Aikido Federation. 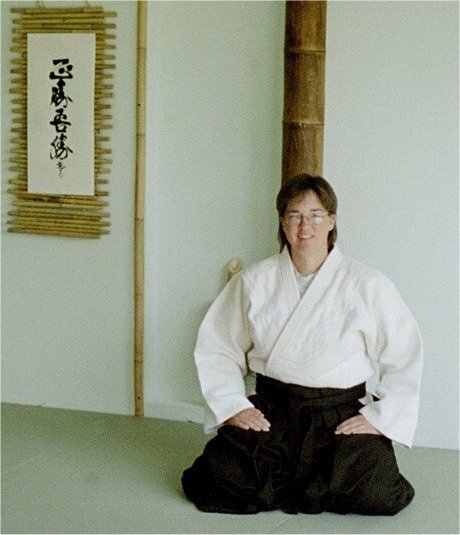 She is chief instructor at Shinzen Dojo Aikido of Clovis and also teaches at California State University, Fresno, in the martial art of Aikido,and self defense classes, as well as offering seminars for individual groups and businesses in womens personal safety and self defense throughout California. Tammy Lee Anderson is a graduate of California State University, Fresno, MFT Counseling program. As a licensed Marriage and Family counselor she began her counseling practice in 2004 through Fresno Family Counseling Center under the direction of Dr. Juan Garcia, LMFT. She continued her practice and study in Gestalt therapy under Jim Doak, LCSW. She also specializes in Hypnotherapy and personal wellness coaching. Tammy is a graduate of the Hoffman process and believes that a therapist can facilitate the healing of clients only to the extent that the therapist has done their own personal work, in essence, "you cannot give what you do not have." Through the counseling process Tammy facilitates the clients inner wisdom, assisting them in discovering personal empowerment through the exploration and integration of the intellect, emotions, body and spirit. Upon payment for your session an insurance receipt will be given for you to turn into your insurance. We do not offer insurance billing directly. Clovis Martial Arts Aikikai, Shinzen Dojo Facebook page.